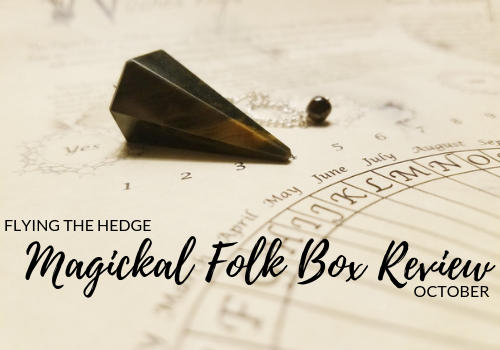 I have received some of the Magickal Folk subscription boxes in the past, but they have changed several times over the past 2 years, which is part of why I have never reviewed the subscription. However, it looks like they have stabilized a little bit, so I felt it was a good time to begin reviewing one of the boxes, the Small Combo Kit. 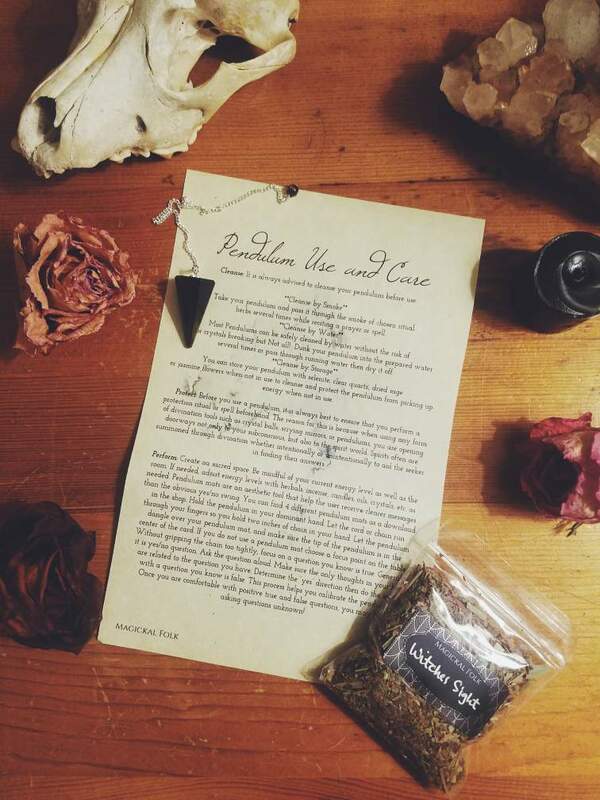 Unlike their other boxes, the Small Combo Kit includes all three of their smaller kits: Ritual Tea Kit, Meditation Kit, and Crystal Alchemy Kit, so it's like receiving three gifts in one! At just $24 per box, it is fairly affordable. October's box focused on Samhain, of course. Upon opening the box I found three pouches full of goodies, each coming with its own direction sheet. The first pouch I opened contained the Ritual Tea Kit. 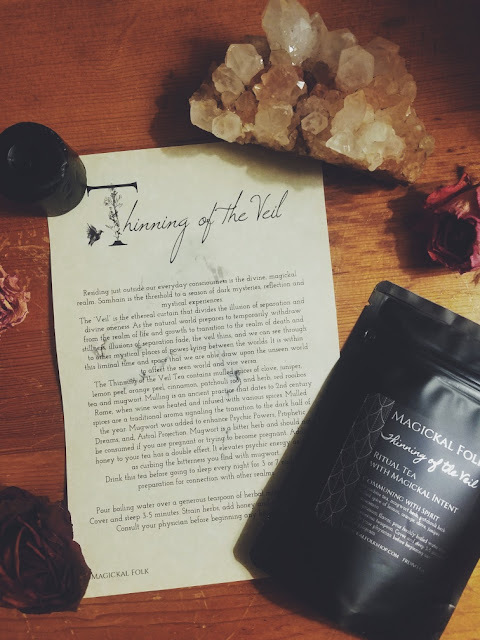 The tea featured for October is the Thinning of the Veil tea which is designed to enhance communication with spirits during dreaming. It contains red rooibos tea, mugwort, patchouli root and herb, and mulled spices of clove, juniper, lemon peel, orange peel, and cinnamon. 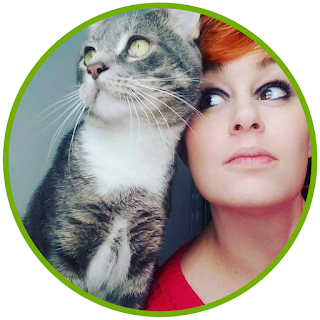 Mugwort enhances psychic power, astral projection, and prophetic dreams, making it the perfect herb to include in a spirit communication tea. According to the directions, the tea should be brewed for 3-5 minutes and be consumed prior to sleeping. The three nights I drank this tea before bed I had very vivid dreams which I recorded in a dream journal. I've never really kept up with a dream journal, but I felt this was the perfect time to start. Needless to say, the tea worked. It's slightly spicy from the mulled spices and bitter from the mugwort, but a spoonful of honey tamed the flavor and enhances the effects of the mugwort. The second pouch I removed contained a pendulum and a pouch of herbs labeled Witches Sight. According to the information sheet, which has a pendulum layout on the back, there are a number of ways to cleanse, protect, and use the pendulum. The herbs in Witches Sight include sandalwood, lilac leaves, lemongrass, mugwort, eyebright, honeysuckle, and lobelia, which are included to raise energy and heighten psychic ability. 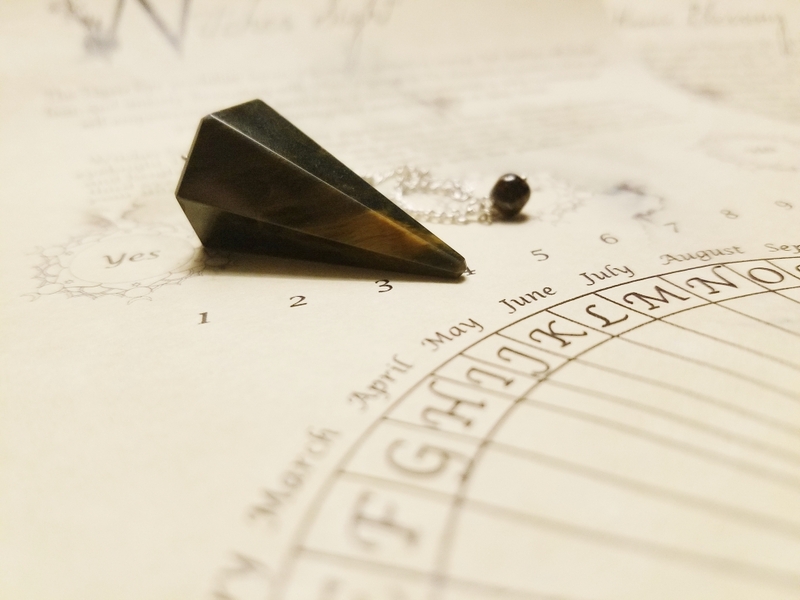 This particular pendulum is light and made of Tiger's Eye which has powerful protective energy. 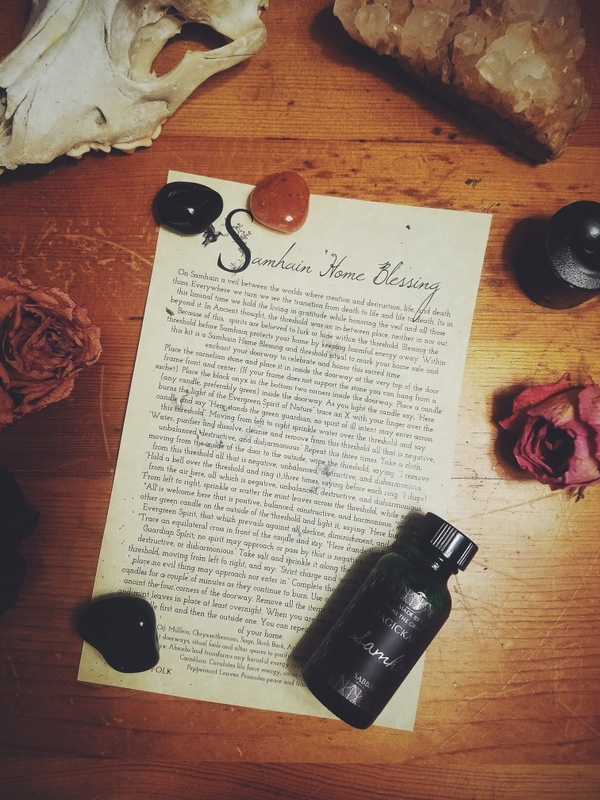 The final pouch contained some of the supplies needed for a Samhain Home Blessing ritual, including one carnelian crystal, two black onyx crystals, mint leaves, and Samhain blessing oil. The oil contains mullen, chrysanthemum, sage, birch bark, apple and Blood Orange, and Allspice essential oil. The oil smells wonderful and the peppermint, while dry, is clearly fresh. The ritual is well written and the instructions are clear. According to the ritual instructions, this ritual is to keep harmful or negative spirits from entering your home on Samhain. Despite the ritual being for Samhain, this sort of home blessing can easily be performed at any time during the year. Overall I am very satisfied with this box. I look forward to seeing what November and December has in store for me. If you would like to see my unboxing video of this box, please check out my YouTube channel. I will have to look into it again. I, too, once subscribed and ended up dropping it because what I was receiving was not worth the price. This box looks great, however.